Armani took a trip to the home depot this past week and seemed to be unfazed by anything going on around him, he was focused and responsive to his handler. His home handlers find him to be a very sweet boy. He is doing Look (zooming in on an object) Get it (getting the object) and Hold( is up to 20+ seconds. Is very responsive to drop it command and is doing on his own. Go Armani! Dior was off to NYC with his home handler for the weekend and did very well on the train ride into the city, he was not overly distracted by the hustle and bussle of the city and behaved very well in the apartment. Dior went for a 7 mile jog in Central park and loved it. Dior had no reaction to the horses, other dogs or much else in the park. What a fun weekend. Dior took a trip to the Danbury mall and was very well behaved throughout the trip. Lunch in Ruby tuesdays had Dior quietly laying under the table and showing no intrest in food. Dior helped in the jean shopping and carried a bag of three jeans up to the counter without dropping them. Dior threw away a plastic bad with ease (up, reach, drop it). The only hiccup in an almost perfect outing was barking at a store front that was displaying wigs in the window ( I think I would have barked too) and was easily redirected. that is great news for our new pups, thanks for sharing the update. 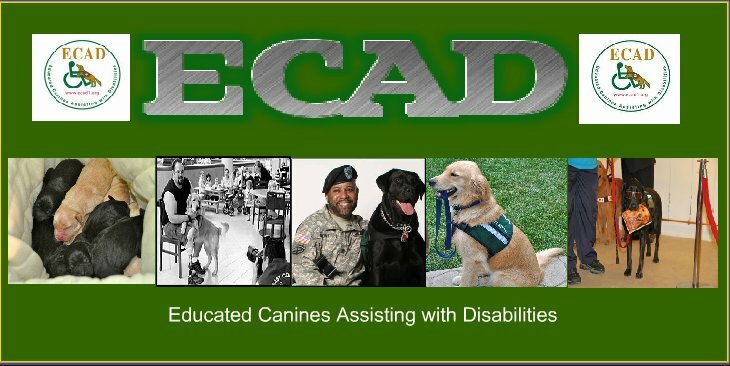 may we continue to hear and read good news from ecad pups.